On March 2, 2015, the Department of Public Works (DPW) will begin to remove parking “space savers”. This includes any items placed in the roadway to hold an on-street parking spot (ie chairs, toters, barrels, crates). Items will be removed from each neighborhood on its regularly scheduled trash collection day. Article 18 section 8 of the City of Cambridge Traffic, Parking, and Transportation Regulations states that “No person shall place, erect or cause to be placed or erected within any roadway, any fixture or structure unless or until a permit has been issued by the Traffic Director.” Public Works has not removed space savers during past month because of the demand that record snow clearing operations have placed on personnel and equipment. While snow clearing continues, the current status of operations is such that trash collection trucks are now able to incorporate the removal of space savers in their weekly collection efforts. 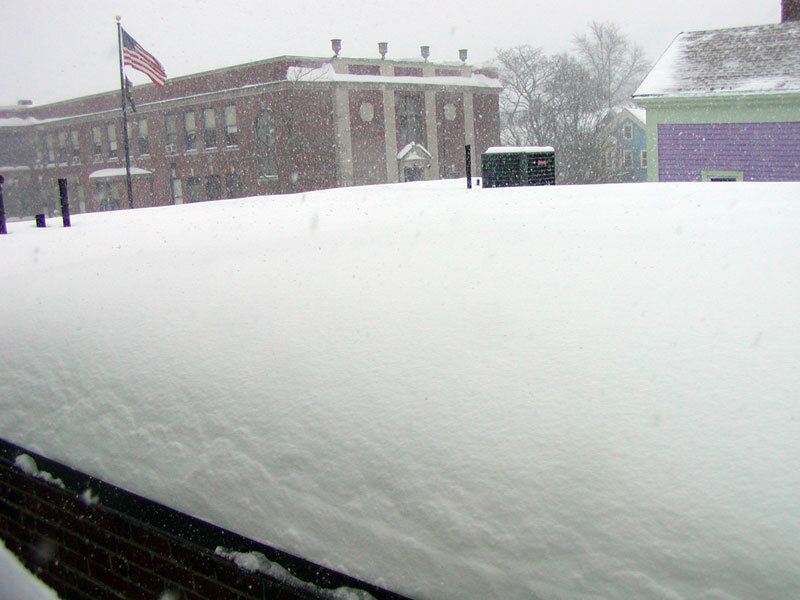 For current information on snow operations visit Cambridgema.gov. Updates are also available on Twitter at @CambMA and Facebook at CambridgeMA.Gov. The City is utilizing the hash tag #CambMASnow on Twitter to help the public follow the conversation. Do You Have What it Takes to be a Cambridge Police Officer? Do you or someone you know possess integrity, courage, and a willingness to help those in need? Perhaps you are ready to pursue a career as a police officer! The City of Cambridge is currently recruiting applicants to take the Commonwealth of Massachusetts Open Competitive Examination for Police Officers scheduled for Saturday, Apr. 25, 2015. An Informational Open House for Cambridge residents will be held Monday, Mar. 9, from 6-7:30 p.m., at the Robert W. Healy Public Safety Building, 125 Sixth St., Cambridge. Check out this informative new video from Cambridge Police Department. For more information, call 617-349-4332, 617-349-3374 or 617-349-4331. The Open Competitive Examination for Police Officers is held to establish an eligible list from which to fill Police Officer vacancies in civil service cities and towns, and MBTA Transit Police. This eligible list may also be used to fill Police Officer vacancies in non-civil service jurisdictions. The early application deadline for the next Open Competitive Examination for Police Officers is March 13, for a $100 fee and the final deadline is March 26, for a $150 fee. To apply, visit www.mass.gov/civilservice or call 617-878-9895. More job information is available online at www.CambridgeMA.gov/Jobs or by contacting Personnel@cambridgepolice.org. 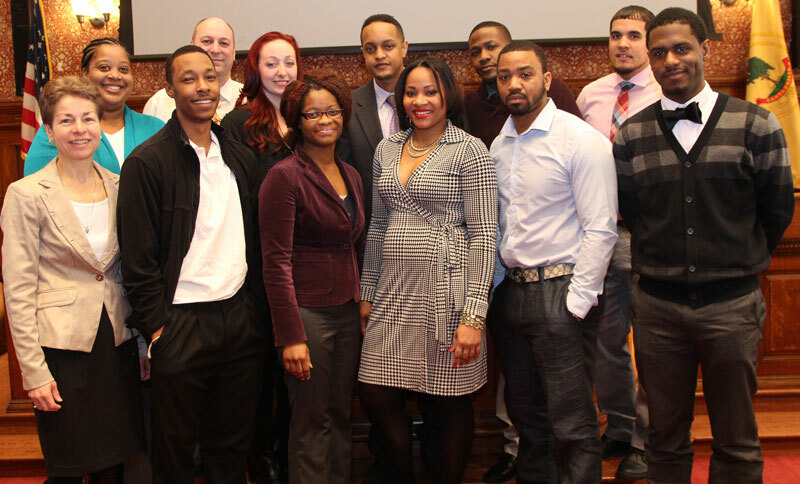 Feb 20, 2015 – Cambridge Works, the City’s transitional jobs program for younger residents (age 18-35) who haven’t been able to get or keep jobs, celebrated its 14th graduating class during a special ceremony Feb. 19, at Cambridge City Hall. The program provides a temporary job with the City of Cambridge, and/or other partner employers, while also offering intensive case management, soft skills development and job search assistance to help participants secure an unsubsidized job upon program completion. Cambridge Works is coordinated through the Office of Workforce Development for the Department of Human Services Program (DHSP). A former Cambridge Works graduate, Chris Rodriguez, returned to give the recent class some words of advice, encouraging them to never give up and reminding them of the dedicate staff team that will be there for them even after the program has ended, to help them secure employment utilizing the skills they learned. HOW WILL YOU MOVE CAMBRIDGE FORWARD? The Cambridge Redevelopment Authority (CRA) announced on Feb 18, 2015 the establishment of the Forward Fund, a new microgrant program intended to support innovative pilot projects by non-profit organizations, community groups, and small businesses throughout Cambridge. They will be awarding Planning & Design grants up to $2,500 and Capital grants up to $10,000 for a wide variety of projects that contribute to the civic and social capital of Cambridge. Most of the business from the three delayed or cancelled City Council meetings was taken up on Friday, Feb 20 at the first of these twin meetings, but there are a few items left, including all of the Calendar. Before getting to the flotsam and jetsam on Monday’s agenda, I would like to say a few words about something extraordinary that took place at the Friday meeting. Specifically, the City Council showed some resolve, and I hope this continues – especially if and when more serious matters are before the Council later this year. We sure could have used this last year when the misguided Carlone Petition was dragged out for months even though only fools believed it ever had the votes of more than 2 or 3 councillors (and it needed as least 6 to be ordained). Of course the Carlone Petition was really all about political organizing and not especially about governance. Specifically, there was an Order on the Friday agenda contained in a report from a Government Operations Committee meeting that called for developing one or more approaches to publicly financed municipal elections in Cambridge. There are many reasonable people who can make a good case for doing this at the state and/or federal level, but I have not yet heard any convincing rationale for doing this for our municipal PR elections. There has also been more than a passive suggestion that such "clean elections" would be a response to implied corruption among elected city councillors who have accepted donations from major property owners/developers. I have never personally seen any evidence of this. There is also a very low threshold for candidacy in the municipal elections – just 50 valid signatures – and Councillor Kelley has convincingly proven that you don’t need a big bankroll to be reelected as long as you can maintain the respect of the people who have voted for you in the past. New candidates often face a challenge in wrestling away #1 votes from incumbents or corralling their own quota of ballots from uncommitted voters to gain election, but the most recent election showed that it’s not impossible and it may even be getting easier in this day of social media. Councillor Kelley asked simply: "What’s the problem that this proposal is trying to fix?" That’s exactly the point. Normally I would have expected the City Council, out of some misguided notion of courtesy, to kick this can down the road, generate a shelf full of studies, waste lots of staff time and ultimately say, "Never mind." This time, they voted and defeated this pointless initiative on a 2-4-1-2 vote (2 Yes, 4 No, 1 Abstain, 2 Absent). Had there not been two councillors absent, I suspect it would have been a 3-5-1 or a 3-6 vote. [Note: Mazen arrived late and added his YES vote to make this 3-4-1-1.] In any case, I would like to commend Councillors Cheung, Kelley, Toomey and Mayor Maher for their resolve in throwing this overboard. There may yet be discussion about this in Government Operations, but at least the Council will then be deciding whether or not to do something prior to drafting plans for how it is to be done. Another Order that called for the creation of an "ombudsman" position came close to a similar fate, though ultimately it was made subject to the Charter Right by Councillor McGovern. Anyone who has ever dealt with the Community Development Department or just about any other City Department knows just how helpful and cooperative (to a fault) most City staff are. Councillor Toomey and Vice Mayor Benzan also correctly pointed out that one of the most fundamental roles a city councillor plays is as a go-between when residents feel they need an advocate. I really had hoped the City Council would have just voted this Order down, but the Charter Right is nondebatable and we’ll just have to wait until another day (maybe Monday) to see what happens. Oh, yeah, and on Friday they also talked a lot about snow. That’s why they’re our representatives. We’ve all been talking a lot about snow. See my comments above or in my notes for the Fri, Feb 20 meeting. I’m not sure if this item can be properly acted upon yet. If the interpretation is that these twin meetings are really formally the same meeting, then we’ll have to wait until the March 2 meeting before the City Council can take up the question. 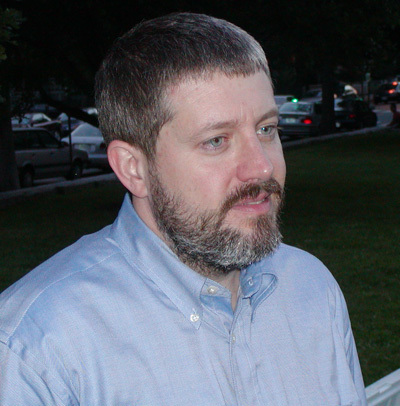 The people who work at CDD are my neighbors and friends, and Brian was a great friend to me personally and to many other people throughout Cambridge and elsewhere in Massachusetts. Manager’s Agenda #2. Transmitting communication from Richard C. Rossi, City Manager, relative to a requesting that the City Council refile and again refer the Normandy/Twining Zoning Petition to the Planning Board. This re-filing is necessary because of the snow cancellations that prevented the scheduled Planning Board meeting to occur within the legally required time frame. Meanwhile the Cambridge Residents Alliance, a.k.a. the Peoples’ Revolutionary Front to Stop Everything has already drafted its TalkingPoints Memo for its drone activists to recite at meetings explaining why new housing near transit is bad for people. Manager’s Agenda #6. Transmitting communication from Richard C. Rossi, City Manager, relative to amendments and other related documents associated with the proposed Plastic Bag Ordinance. The proposed amendments are all well-founded and should be given proper consideration by the City Council prior to ordination. I have commented on this previously, so I’ll simply say that the City Council should pass this Order. If not, the majority of city councillors who have expressed support for this rebuke will have been played by those who want to use delay in order to solidify their propaganda. Sometimes a rebuke is exactly the right thing to do. There are better plans circulating for Pearl Street that would designate it as a bike/ped priority street without segregating cyclists and compromising resident parking needs and other curbside activities. Again, I have commented previously about the idea of a standing intercommunity committee of local elected officials from Cambridge and its neighbors. It would be a good way to address more regional concerns, especially in the areas of housing and transportation. This policy order is an insult to all of the good people who work for the City who have been consistently helpful to residents in practically every way. I sincerely hope the City Council has the wisdom to reject it. Committee Report #1. A communication was received from Paula Crane, Deputy City Clerk, transmitting a report from Vice Mayor Dennis A. Benzan, Co-Chair of the Economic Development and University Relations Committee and Councillor Nadeem A. Mazen, Chair of the Neighborhood and Long Term Planning, Public Facilities, Arts & Celebration Committee conducted a STEAM Summit on Dec 10, 2014 to present research by the STEAM Working Group and to present the Working Group’s recommendations. I have also commented on this previously. Suffice to say that the intention of these efforts is commendable and I hope that we can capture the interest of young people in every possible way to find a future that takes full advantage of those industries and educational institutions that are all around us in Cambridge. I am not yet convinced that a City Council-inspired plan is the best approach. What is really needed is some re-thinking among all local educational institutions about how to best match Cambridge residents, especially very young Cambridge residents, with the wealth of opportunities all around them. This should be as much about inspiration as facilitation. We all like parks and open space, but I’m not yet convinced that this proposal is about creating amenities so much as simply blocking new construction, including the construction of new housing. It’s definitely worth pointing out that the original 7.5 acre proposal predates the donation of open space that grew out of the Alexandria re-zoning process. No plan should remain static as circumstances change, and until very recently very few people actually believed that the Volpe site might actually become available anytime soon. Give us a break. This effort to politicize the Special Permit process expired with two-thirds of the latest Teague Petition. Committee Report #6. A communication was received from Donna P. Lopez, City Clerk transmitting a report from Councillor Timothy J. Toomey, Chair of the Government Operations, Rules and Claims Committee for a public hearing held on Jan 20, 2015 to discuss changing the method by which surplus votes are transferred in Municipal elections whether the Fractional Transfer Method could replace the Cincinnati Method and whether this requires a Chapter change and to discuss the Clean Election Law. The Snow Emergency Parking Ban will be lifted at 7:00am on Wed, Feb 18. Trash/Recycling is one day behind this week due to the holiday. If your trash/recycling is not collected, please leave it out an additional day for crews to pick up. Please call Public Works with any questions, 617-349-4800. Residents parked at Harvard’s 52 Oxford St. Garage and MIT’s 65 Waverly St. lot must exit by 9:00am on Wednesday. Residents parked at Green St. Garage & One Kendall Square Garage must exit by 9:00am on Wednesday or stay, and pay for parking. Residents at Cambridgeside Galleria Parking Garage Levels 4 or 5, and at the City’s First Street Parking Garage can stay for free until Sunday, Feb 22 at 8:00pm. After that, they can opt to stay and pay regular fees. A Cambridge Snow Emergency Parking Ban remains in effect until further notice. City offices and programs will be open on Tuesday, Feb. 17. Rubbish and recycling will be one day behind schedule for the week due to President’s Day holiday. Maintaining the snow emergency parking ban until further notice. Crews resume snow removal and hauling operations throughout Cambridge Monday, Feb 16 at 9:00pm. The City expects to have over 100 pieces of equipment on the road at this time. In addition to prioritized main arteries, crews will be addressing secondary streets and dead-ends as identified by public safety officials. A team of operators will use bobcats, loaders, and dump trucks to remove piles of snow, most particularly on corners and on dead-ends. Not all snow on a street will be removed, but clearing will be done to ensure emergency vehicle access. Removal and hauling is primarily an overnight operation due to traffic challenges during daytime hours, though certain locations may be done during the day if feasible. This work is expected to take numerous evenings to complete, and may continue into next week. How are streets selected for this operation? purpose of these operations is to ensure emergency vehicle access. Given the huge volume of snow, the City is unable to provide removal and hauling at all streets. Public safety officials are evaluating certain two way streets that have been narrowed due to snow, and will be converting some of these to temporary one-way streets. The City expects to begin this program in East Cambridge in the next several days, and potentially expand to other streets as feasible. Additional details about program will be posted once finalized. 3) Maintaining the snow emergency parking ban until further notice. A citywide parking ban began at 7:00pm on Saturday, Feb 14 and will remain in effect until public safety officials determine it is safe to lift the ban. We thank residents for their cooperation in helping us to keep roadways clear. We also thank local garages that have partnered with us to offer residents parking during these repeated snow emergencies. Please note that Green St Garage, First St. Garage and the 50 Oxford St. Garage are currently full. Please see alert at www.cambridgema.gov for more information about available parking. Despite the challenging weather conditions we face, the City has devoted the personnel and resources necessary to maintain public safety. We will continue snow clearing efforts into the coming week and beyond. For more information about the City’s overall approach to snow operations, and the response to the Presidents’ Day Weekend Blizzard, see alert at www.cambridgema.gov. Sat, Feb 14 – A Snow Emergency will go into effect starting at 7:00pm for Cambridge. Happy Valentine’s Day. The City of Cambridge is declaring a Snow Emergency Parking Ban Saturday, Feb 14 at 7:00pm. Parking will be prohibited on streets signed No Parking during Snow Emergency. Towing operations will begin at this time. Please note that some streets may still maintain temporary no parking signs even after the ban is lifted due to the current conditions. Free off-street parking is available to Cambridge residents with Resident Parking Permits issued by the city’s Traffic, Parking and Transportation Department at the locations listed below from the time the ban goes into effect until 2 hours after it is lifted. Please note that other locations we generally make available during a ban, such as First Street and Green Street Garages, are currently full due to the current conditions. CambridgeSide Galleria Parking Garage. Free parking is valid for the upper garage only, Levels 4 and 5; enter on First Street at Sears. Vehicles parked in the lower garage (Levels A, B & C) will be asked to pay the regular parking fees. Generally free resident parking is available from the time the declared snow emergency is in effect until 2 hours after it is lifted. Due to the extensive amount of snow that has accumulated in the area, persons with a Cambridge resident parking permit can park at this location from now until Sunday, Feb 22, 2015. 52 Oxford Garage. This is a Harvard owned and operated garage. It is open to City residents with a resident parking permit on a space available basis for no fee from the time the declared snow emergency is in effect until 2 hours after the ban is lifted. Space is limited, and availability is on a first-come, first-served basis. The University reserves the right to cease admittance due to capacity limitations and operation issues. 65 Waverly Street. This is an MIT owned surface lot at the corner of Sidney, Waverly and Erie adjacent to Fort Washington Park. Parking is free with a resident permit until 2 hours after the ban has is lifted. One Kendall Square Garage. This is a privately owned garage next to the Kendall Square Cinema. Parking is free for Cambridge residents with a resident parking permit on their vehicle until 2 hours after the ban is lifted. The garage entrance is at 389 Binney Street. We are currently experiencing delays in trash collection due to weather conditions. If your trash was not collected on Friday, please leave it out and it will be collected on Saturday. Check this site for more updates and information or call Public Works at 617-349-4800. City Offices will be closed on Monday, Feb 16 in observance of the Presidents’ Day Holiday. There will be no trash or recycling pickup Monday, Feb 16, and routes will be one day behind schedule for the rest of that week. Any regular programs scheduled for Feb 14 will take place, however programs for Feb 15, including War Memorial programs, have been cancelled. DPW crews continue to work to keep main roadways clear. Property owners are asked to do the best they can under the extremely challenging conditions to clear sidewalks, corner crossings, catch basins and fire hydrants of snow. Business owners are requested, if there is a disability parking space on the street near their storefront, to please take the extra time to shovel a clear path to that space. In particular, shovel a space wide enough so that vans with lifts can deploy the lift onto the sidewalk. The historic amounts of snow that have fallen in the past two weeks have created special challenges for the city and the region. Even with plowing and snow removal, streets in Cambridge and the Greater Boston Area remain narrow. The MBTA continues to experience weather related failures and delays and has announced that service will be suspended on Sunday, Feb 15. Please see more on this at www.mbta.com. Drivers should allow additional travel time, exercise patience during slower traffic patterns, and use extra caution at intersections and crosswalks. Prior to traveling, residents are asked to ensure that snow is cleared from the top of their motor vehicle to create safer conditions for those travelers around you. Drivers should use their best judgment when considering whether to park in areas where large snow piles are still alongside the curb, to ensure they do not block the flow of traffic. Updated information will be available at www.cambridgema.gov. In addition, the public is encouraged to follow updates on Twitter at @CambMA and on Facebook at CambridgeMA.Gov. The City will be utilizing the hash tag #CambMASnow on Twitter to help the public follow the conversation. Members of the public can also call 617-349-4800 or 617-349-4700 for information. Members of the public are encouraged to sign up to receive notification of snow emergency parking bans at http://www.cambridgema.gov/AlertNetwork. Feb 10, 2015 – Cambridge will be lifting the Snow Emergency Parking Ban at 7:00am on Wednesday, February 11. Residents who are taking advantage of the free off street parking program will have until 9:00am on Wednesday to exit the Green Street Garage and the One Kendall Square Garage before being charged. Residents parked at Harvard’s 52 Oxford Street Garage and MIT’s 65 Waverly Street lot must exit these locations by 9:00am. The City is announcing an extended free parking program being offered at both the Cambridgeside Galleria Parking Garage and the City’s First Street Parking Garage through February 22 in recognition of the historic amounts of snow that Cambridge has received during the past few weeks, including the 18.5 inches of new snow that fell over the past few days. Residents with a valid 2015 City of Cambridge resident parking permit on their vehicle who are having difficulty finding street parking or are traveling for February school vacation week can participate in the extended free parking program at the Cambridgeside Galleria and First Street Garages until Sunday, February 22 at 8:00pm. Parking for this program at the Cambridgeside Galleria Parking is restricted to the upper garage, levels 4 and 5. The upper garage entrance is located on First Street, closest to Sears. The First Street Garage is open, subject to availability. Vehicles without a 2015 Cambridge resident parking permit will be charged full parking rates. Residents currently parked in the First Street garage do not have to exit once the parking ban is lifted; however, residents who parked their vehicle at the Cambridgeside Galleria need to exit and reenter through the First Street entrance and park on levels 4 or 5. In addition to this free short-term program, the City of Cambridge offers a year-round discounted parking program at the First Street Garage to Cambridge residents with a current City of Cambridge resident parking permit on their vehicles. Even with plowing and snow removal, streets in Cambridge and the Greater Boston Area are getting narrower due to snow accumulation. Prior to traveling, residents are asked to ensure that snow is cleared from the top of their motor vehicle to create safer conditions for those travelers around you. Drivers should use their best judgment when considering whether to park in areas where large snow piles are still alongside the curb, to ensure they do not block the flow of traffic. Any parked vehicle that obstructs a 10 foot wide safe travel lane will be ticketed and towed. Updated information will be available at www.cambridgema.gov throughout the storm. In addition, the public is encouraged to follow updates on Twitter at @CambMA and on Facebook at CambridgeMA.Gov. The City will be utilizing the hash tag #CambMASnow on Twitter to help the public follow the conversation. Members of the public can also call 617-349-4800 or 617-349-4700 for information. Members of the public are encouraged to sign-up to receive notification of snow emergency parking bans at http://www.cambridgema.gov/AlertNetwork. UPDATE: All Cambridge City Offices and Cambridge Public Schools will remain closed on Tuesday, February 10. The Snow Emergency/Parking Ban remains in effect. Tuesday’s curbside trash and recycling pick up will occur as scheduled. Feb 8, 2015 – A Snow Emergency Parking Ban went into effect at 4:00pm today (Sun, Feb 8). [City Notice] Cambridge residents with a current Resident Parking Permit issued by the Department of Traffic, Parking and Transportation can take advantage of the City’s free off street parking program during the declared snow emergency parking ban. A complete list of off street locations as well as a listing of streets with parking restrictions during a snow emergency can be found at www.cambridgema.gov. Curbside trash and recycling collection will occur on Monday as scheduled. Due to the large amount of snow received in the area, trash and recycling trucks may not be able to get to all streets scheduled for a given day. If this does happen, DPW asks residents to leave their trash/recycling out on the curb for pick up the following day. In the event the roadway conditions do not allow for trucks to access the roadway the following day, residents should remove all trash and recycling from the curb and place their contents curbside the following week on their regularly scheduled day. All City offices and programs, as well as the Cambridge Public Schools, will be closed on Monday, February 9. All public meetings, including the City Council meeting, have been cancelled for Monday. Additional information regarding school closings can be obtained by calling 617-349-6513 or visiting www.cpsd.us. Information about rescheduled meetings will posted to the City’s website. 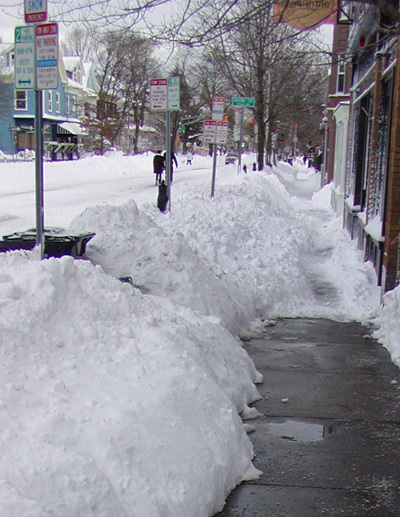 Property and Business owner’s participation in clearing sidewalks will help the City return streets and sidewalks to safe, passable conditions as quickly as possible. When it snows or is icy this winter, please think about all the people who might be using your sidewalk and the challenges they may face if snow or ice is not fully cleared. City Ordinance requires that owners remove snow and ice from all sidewalks next to their property. The path on shoveled sidewalks must be wide enough for someone using a wheelchair, walker, or stroller (at least 3 feet, preferably 4 feet wide). Corner properties must clear sidewalks on all sides surrounding the property and clear ramps at cross-walks. Additionally, business owners are requested, if there is a disability parking space on the street near your storefront, to please take the extra time to shovel a clear path to that space. In particular, shovel a space wide enough so that vans with lifts can deploy the lift onto the sidewalk. The historic amounts of snow that have fallen in the past two weeks have created special challenges for the City and the region. Even with plowing and snow removal, streets in Cambridge and the Greater Boston Area are getting narrower. Additionally, the MBTA has experienced numerous weather related failures and delays. Commuters should allow additional travel time, exercise patience during slower traffic patterns, and use extra caution at intersections and crosswalks. Prior to traveling, residents are asked to ensure that snow is cleared from the top of their motor vehicle to create safer conditions for those travelers around you. Drivers should use their best judgment when considering whether to park in areas where large snow piles are still alongside the curb, to ensure they do not block the flow of traffic. Galleria Mall. Enter on Cambridgeside Place, Between P.F Chang’s and The Cheesecake Factory Entrance. Residents of Cambridge can park for free in the Cambridgeside Galleria Garage from the time the declared snow emergency is in effect until 2 hours after it is lifted. First Street Garage. Enter on Spring Street. Parking is free if you have a Cambridge resident parking permit from the time the declared snow emergency is in effect until 2 hours after it is lifted. Green Street Garage, Central Square. Parking is free if you have a Cambridge resident parking permit from the time the declared snow emergency is in effect until 2 hours after it is lifted. 52 Oxford Garage. This is a Harvard owned and operated garage. When a Snow Emergency is declared it is open to City residents with a resident parking permit on a space available basis for no fee from the time the declared snow emergency is in effect until two hours after the snow emergency is lifted. Important — vehicles parked in this garage must exit no later than two hours after the ban is lifted. Space is limited, and availability is on a first-come, first-served basis. The University reserves the right to cease admittance due to capacity limitations and operation issues. 65 Waverly Street. This is an MIT owned surface lot at the corner of Sidney, Waverly and Erie adjacent to Fort Washington Park. Parking is free with a resident permit from the start of the snow emergency until 2 hours after it has been lifted. One Kendall Square Garage. This is a privately owned garage next to the Kendall Square Cinema. Parking is free during snow emergencies for Cambridge residents with a resident parking permit on their vehicle from the time the City’s declared snow emergency is in effect until two hours after it is lifted. The garage entrance is at 389 Binney Street. Keep those fire hydrants clear of snow! Map of Cambridge fire hydrants – Zoom in for a closer look. Effective 7:00am on Tuesday, February 3, the Snow Emergency Parking Ban will be lifted. Snow clearing crews will be working through the night. City offices will be open. DHSP pre-schools, after-schools, youth centers, and the King Open Extended day programs will open at 10:00am. Cambridge Public Schools will be closed on Tuesday, February 3rd due to the winter weather conditions. Curbside trash/recycling will occur as scheduled. All Community Schools will be closed. Classes will not be held at the Community Learning Center. Senior Centers will be open to serve seniors, but classes are canceled. The School Committee Meeting scheduled for February 3rd is cancelled. Feb 2, 2015 – The City of Cambridge will be closing all buildings to the public today at 2:00pm and all public meetings and programs have been cancelled, including the City Council meeting. Items originally scheduled to be before the City Council tonight will roll into the agenda for the Feb 9, 2015 meeting. The public can find rescheduled meeting times on the City’s online calendar at www.cambridgema.gov. Residents are reminded that a snow emergency parking ban is still in effect. Parking is prohibited on streets signed No Parking during Snow Emergency. If you need to travel, please ensure that snow is cleared from the top of your motor vehicle to create safer conditions for those travelers around you. Information on when the snow emergency parking ban will be lifted will be available on the City’s website, www.cambridgema.gov, on Twitter at @CambMA, and on Facebook at CambridgeMA.gov. Additionally, subscribers to the Cambridge Alter Network will receive notification. The public can sign-up to receive notification of snow emergency parking bans at cambridgema.gov/AlertNetwork. The Department of Public Works (DPW) will continue to clear streets throughout the night, starting with major arteries. Your patience and participation in clearing sidewalks helps the City return streets and sidewalks to safe, passable conditions as quickly as possible. After major street clearing operations have been completed, crews will begin working on high traffic bus routes to clear snow from bus stops, ramps, and crosswalks. City Ordinance requires property owners to remove snow from sidewalks next to their property or business within 12 hours of daytime snowfall and before 1:00pm when it has fallen overnight. Property owners must also remove or melt all ice within 6 hours of the time it forms. There is a $50 fine for each day of non-compliance. Property owners are asked that when shoveling their sidewalks to please maintain a minimum of 36 inches clear width, so that people who use wheelchairs and other mobility devices (also parents using strollers, etc.) can navigate the sidewalk. The Cambridge Commission for Persons with Disabilities (CCPD) requests that a 48 inch clear width be created when possible – this gives an extra measure of safety. Additionally, CCPD urges residents and businesses to pay particular attention to the corners, where one sidewalk meets another – shovel the full length and width of curb ramps, so that pedestrians with disabilities can get to the crosswalks. Business owners are requested, if there is a disability parking space on the street near your storefront, to please take the extra time to shovel a clear path to that space, so that your customers with disabilities can visit your establishment. In particular, shovel a space wide enough so that vans with lifts can deploy the lift onto the sidewalk. The City recognizes the effort that goes into shoveling out any vehicle parked on a city street during a snow event. However, residents may not use objects such as trash/recycling barrels, furniture items or any other item to save parking spots on public streets. These items will be treated as trash and disposed of by DPW. Feb 1, 2015 – The City of Cambridge is declaring a Snow Emergency Parking Ban effective at 5:00am on Monday, February 2nd. Parking will be prohibited on streets signed No Parking during Snow Emergency. Towing operations will begin at this time. Beginning at 4pm Sunday, February 1st, our free off-street parking program, which is available only to Cambridge residents with Resident Parking Permits issued by the Department of Traffic, Parking and Transportation, will go into effect. Galleria Mall. Enter on Cambridgeside Place, Between P.F Chang’s and The Cheesecake Factory Entrance. Residents of Cambridge can park for free in the Cambridgeside Galleria Garage from 4pm Sunday, February 1st until 2 hours after the ban is lifted. First Street Garage. Enter on Spring Street. Parking is free if you have a Cambridge resident parking permit from 4pm Sunday, February 1st until 2 hours after the ban is lifted. Green Street Garage, Central Square. Parking is free if you have a Cambridge resident parking permit from 4pm Sunday, February 1st until 2 hours after the ban is lifted. 52 Oxford Garage. This is a Harvard owned and operated garage. Beginning at 4pm Sunday, February 1st it is open to City residents with a resident parking permit on a space available basis for no fee from the time the declared snow emergency is in effect until two hours after the snow emergency is lifted. Space is limited, and availability is on a first-come, first-served basis. The University reserves the right to cease admittance due to capacity limitations and operation issues. 65 Waverly Street. This is an MIT owned surface lot at the corner of Sidney, Waverly and Erie adjacent to Fort Washington Park. Parking is free with a resident permit starting on 4pm Sunday, February 1st until 2 hours after the ban has is lifted. One Kendall Square Garage. This is a privately owned garage next to the Kendall Square Cinema. Parking is free from 4pm Sunday, February 1st for Cambridge residents with a resident parking permit on their vehicle until two hours after the ban is lifted. The garage entrance is at 389 Binney Street. Wed, Jan 28 – The City’s Snow Emergency Parking Ban was lifted at 4:00pm on Wed, Jan 28. Jan 28, 2015 – As Cambridge Public Schools and City offices prepare to reopen on Thursday, January 28, the Department of Public Works (DPW) will be continuing snow operations well into the weekend. While the citywide Snow Emergency Parking Ban was lifted at 4 p.m. today, there are still many streets that will be marked with temporary “No Parking” signs. Because of the total accumulations received during the blizzard, there are many streets that—while passable to motor vehicle traffic—would be impassable to emergency vehicles and MBTA buses if parking were restored at this point. Residents and visitors are encouraged to check posted signs regularly in order avoid being ticketed and towed. The City will continue to monitor the need for these signs, and will take them down as soon it is safe to do so. Regardless of whether a street has a parking restriction in place, any vehicle parked so far from the curb as to obstruct the safe flow of traffic is subject to ticketing and towing. Drivers should use their best judgment when considering whether to park in areas where large snow piles are still alongside the curb, to ensure they do not block the flow of traffic. The City will begin snow clearing and removal along high volume bus routes on Thursday evening. These routes include approximately 200 MBTA bus stops, nearly 2/3 of the total in the city. All bus stops, crosswalks, and ramps along these routes will be cleared of snow and ice. Crews can work quickly and efficiently during nighttime hours as pedestrian, cyclist, and motor vehicle traffic are extremely low. This work requires the use of heavy equipment, and will take several nights to complete. Crews appreciate the public’s patience as the City works to ensure safe, accessible travel for all users. Residents with questions about snow removal operations can contact the Department of Public Works at 617-349-4800. Inquiries regarding traffic and parking can be addressed by calling the Traffic, Parking and Transportation Department at 617-349-4700. Tues, Jan 27, 2015 – Overnight, the City of Cambridge had more than 130 pieces of apparatus working to keep the major roads clear of snow and ice. The City clears over 125 miles of streets and 23 miles of public sidewalks. “So far, the Cambridge has received between 12 and 15 inches of snow,” said Owen O’Riordan, Commissioner of Public Works. “As residents and business begin the process of digging out, I want to remind them to not shovel snow into the roadway, to clear at least a three foot path on all sidewalks abutting one’s property, and to clear snow around fire hydrants, catch basins, and crossway ramps in their neighborhood.” DPW crews will be working around the clock to clear the snow from city roads and sidewalks. Last night, Cambridge opened a temporary Emergency Shelter at the War Memorial Recreation Center, 1640 Cambridge Street. The shelter is pet friendly, fully accessible, and able to accommodate individuals requiring additional assistance. No residents have had to take advantage of the shelter so far. Citizens with questions about the shelter should call the Emergency Communications Center at 617-349-3300. Information on how people should prepare prior to heading to the shelter is available on www.cambridgema.gov. The City has not experienced any significant power outages or public safety events. Residents are reminded to report any power outages directly to NSTAR at 800-592-2000. Downed tree limbs and wires in the public way can be reported to 617-349-3300. Residents should not approach downed tree limbs and should use extreme caution to avoid downed wires as they could still be live. The City encourages residents to consider relatives, friends and neighbors that live alone, are elderly, or have a medical condition. Please check in by phone or in person with elders and people with disabilities to ensure that they are safe or if they are in need of assistance with clearing snow. The City’s Snow Emergency Parking Ban will remains in effect until further notice. Note: The Cambridge Public Schools will again be closed for Wednesday, Jan 28. Note: City Buildings will again be closed on Wedy, Jan 28. All programs and public meetings have been cancelled. 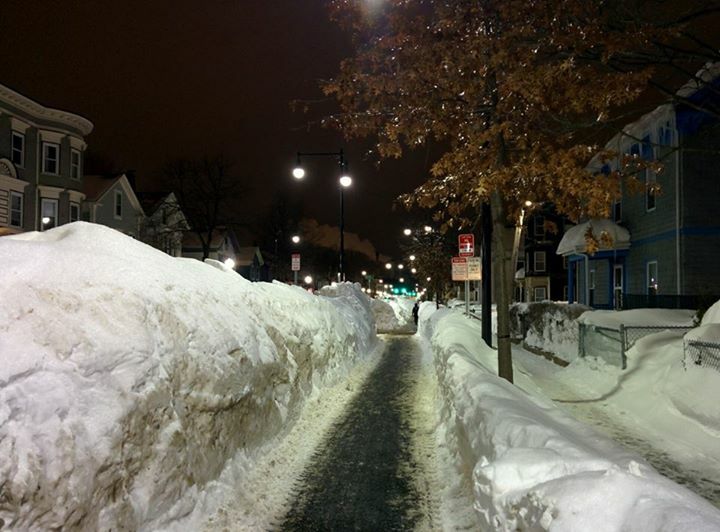 Mon, Jan 26, 2015 – The City of Cambridge is preparing for the approaching blizzard. Updated information will be available at www.cambridgema.gov throughout the storm. In addition, the public is encouraged to follow updates on Twitter at @CambMA and on Facebook at CambridgeMA.Gov. The City will be utilizing the hash tag #CambMASnow on Twitter to help the public follow the conversation. Members of the public can also call 617-349-4800 or 617-349-4700 for information. A Snow Emergency Parking Ban is effective as of 4pm on Monday, January 26. Vehicles parked on streets that are signed “No Parking during a Snow Emergency” will be ticketed and towed until the ban is lifted. For a listing of facilities that provide free parking during snow emergencies, visit http://camb.ma/1thd1ab. All City buildings and programs will close at 6pm on Monday, January 26. All City buildings and programs will be closed on Tuesday, January 27. Public meetings scheduled for January 26th and January 27th have been cancelled or postponed. Updates on new dates will be available on the City’s website. Cambridge Public Schools will be closed on Tuesday, January 27. Curbside trash/recycling collection is cancelled for Tuesday, January 27. Collection will be delayed by one day for the remainder of the week. MBTA will not be operating on Tuesday, January 27. With the potential for heavy snowfall and strong winds, some areas may be affected by power outages. Please report any outages directly to NSTAR at 800-592-2000. In addition to following updates on the city’s website and social networks, members of the public are encouraged to sign-up to receive notification of snow emergency parking bans at http://www.cambridgema.gov/AlertNetwork. SNOW EMERGENCY and PARKING BAN (on posted streets) will go into effect in Cambridge starting at 4:00pm on Monday, January 26. Also, Governor Baker has declared a ban on motor vehicle travel beginning at midnight tonight (Mon 1/26) and continuing until further notice has been issued. There are exceptions for public safety vehicles and public safety workers, and other essential travel. Details of the exceptions to follow. Governor Baker also announced that the MBTA will shutdown at midnight tonight (Mon 1/26) and will not operate on Tuesday 1/27. A State of Emergency for the entire Commonwealth was declared today (1/26/15) as of noon (12:00pm).